I keep wondering how many beers from Samuel Adams I've actually tried. I'm willing to bet it's at least 25, yet they keep coming out with new beers! More for me to try! Not a bad problem to have. So up for review today we have the Samuel Adams Chocolate Bock. 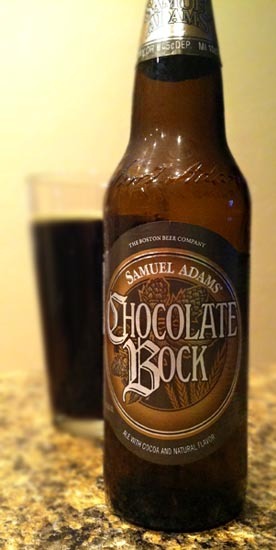 Samuel Adams Chocolate Bock pours the color of cola with a thin head that disappears incredibly quickly. It was pretty much gone before I could take a picture. If you saw a glass of this, without smelling it, you'd likely guess this was Coca Cola, Pepsi, or Dr. Pepper. That's exactly what it looks like. Smelling is a different story with medium roasted malt and a sweetness that's a lot like milk chocolate. Tasting brings a thin-bodied mouthfeel with more milk chocolate and hot cocoa mixed alongside a vague taste of cola and weak coffee, with an underlying maltiness and a smooth finish. Drink This: if you want a lighter-bodied chocolate beer that won't weight you down. Don't Drink This: if you're looking for a thick, hearty chocolaty chocolate beer.